A French Thanksgiving Off the Coast of Maine | Parlez-Vous American? American thanksgivings are characterized by slabs of roasted meat, free-flowing liquor and good cheer. This tradition is usually traced to the Pilgrim Fathers, and a feast they shared with the local Indians at Plymouth (Massachusetts) in 1621. However, it’s now widely accepted that there are many other possible origins for the tradition of Thanksgiving, including Spanish celebrations held in Florida in 1565 and Martin Frobisher’s thanks at having survived his search for the Northwest Passage and returning to Newfoundland in 1578. The elements of a thanksgiving feast were also present in a celebration held in Acadia, 16 years before the Pilgrims landed at Plymouth. Having survived a harrowing winter off the coast of Maine, the French settlers inaugurated their first winter in Port Royal with a feast, and the creation of the Order of Good Cheer. In 1604, three years before the founding of Jamestown, Virginia, and 16 years before the Pilgrims landed at Plymouth, a French expedition led by Pierre Dugua, Sieur de Mons, set out to explore the northern part of America, and establish a settlement. The site they chose was Sainte Croix Island, on the northern border of Maine (now an International Heritage Site). While the seventy-five members of the expedition set up buildings on the island and attempted to sow crops, they had arrived too late in the year (August), and the island was not well-suited to farming. In addition, snow came early (October 6th), and the settlers had used most of the wood on the small island to build their lodgings. Ice in the river prevented them from leaving the island easily. When ships returned from France the next year, around half the colonists had died, most from what they called mal de terre (“a sickness of the land”), which is now thought to have been scurvy (which would have been caused by a diet deficient in fresh fruit and vegetables). It was decided that the colony would be moved to a more hospitable location. Samuel de Champlain, the King’s cartographer, explored the coast of New England as far as the future sites of Boston and Plymouth. He and his crew spent some time exploring the Kennebec River, where a local chief told them about the arrival of an English ship, which would return the next year to found the Popham Colony (present-day Phippsburg, Maine). Returning to Saint Croix, the expedition then moved the remaining settlers and their houses to what is now Nova Scotia, to found the settlement of Port Royal. 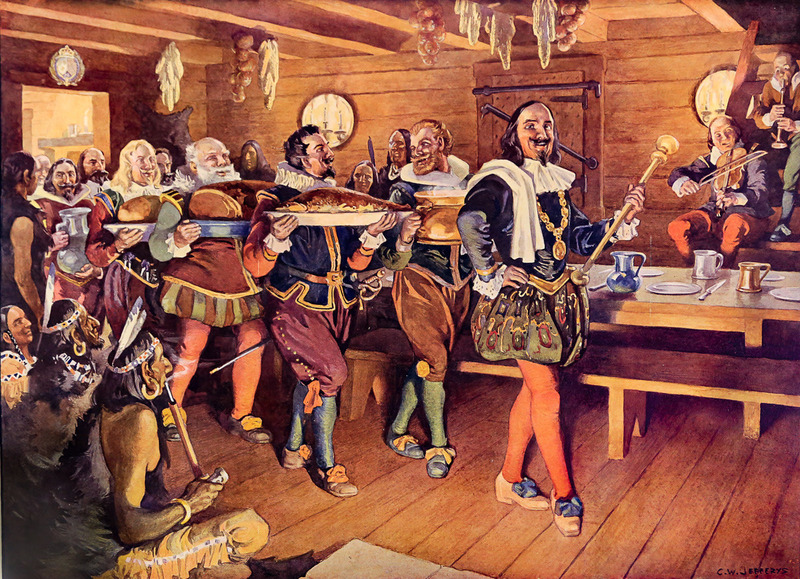 “To keep us happy and content, at least in regard to food, an Order of the Table was established, presided over by Sieur de Poutrincourt, which was named THE ORDER OF GOOD CHEER, first put forward by Champlain, whereby those at the aforementioned table each acted as steward in turn, once in a fortnight. Now he whose turn it was had the task of keeping us well and making sure that we were treated honorably. This was so well observed, that even though the gourmands over here [in France] often tell us that there we have nothing like the Rue aux Ours in Paris [a street renowned for its meat-roasters] we made as good cheer as we might do in the Rue aux Ours, and at less cost. In addition to the eating and drinking, the weeks-long celebration featured the first play to be written and performed by Europeans in the New World, The Theatre of Neptune in New France, by Marc Lescarbot. L’Ordre de Bon Temps became the first order of knighthood in the New World, and is still awarded by the government of Nova Scotia. Despite the efforts of the knights, Port Royal itself was abandoned the following year (1607), and the settlers returned to France. Sieur de Poutrincourt came back in 1610 to re-establish the colony, but it was sacked and burnt, along with the remains of the Sainte Croix colony, in 1613 by English admiral Samuel Argall, sailing from Virginia. For the next century Port Royal would continue, like the rest of Acadia, to be the site of many struggles between the English and French – just as our sense of history has become a struggle by the English version of events to overwhelm elements of the French history of North America. For Americans sitting down to Thanksgiving dinner this week, give a thought not just to the Native American peoples who participated in the Plymouth feast and many others, but also to the many other European traditions of this continent.